I recently saw a video of someone’s rant about how our children are being brought up in a society where they think they are entitled to receive what they want. 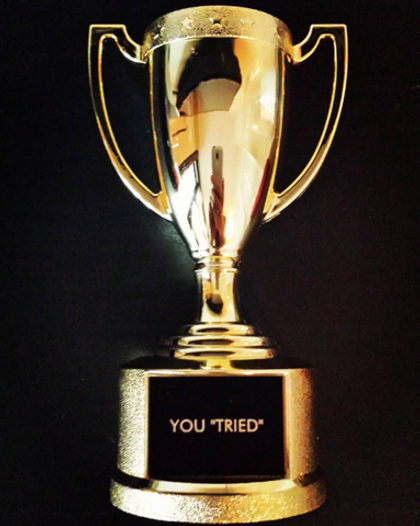 The example being used was the concept of a “participation trophy”, when team players of a sport all receive a trophy just for being there. No winners or losers, in other words. While I agree that this is unhealthy—in that it produces an assumption that everyone wins or gets the job they want—as I thought about it I realized that there is an underlying problem that is far more disturbing. Most of the world is competitive. One might say that it’s a natural human trait. But why are we constantly trying to better ourselves just to be better than everyone else? We shouldn’t be spending so much energy in the pursuit of perfection if it is only to serve our ego. Particularly as Jedi, our goal should be to humble ourselves. We don’t need trophies, and especially not participation trophies. We are mere conduits of the Force. We deserve no high standing, awards, ranks, or recognition, because it is the Force working through us that brings about its will.